One of the great advantages of food trucks is that owners are on the truck daily. This brings a tight bond between the owner and their hungry patrons. Since many of us only get that small time between ordering and grabbing our food, I wanted to help bring us together. That’s when I got the idea, Behind The Wheel. Gets me back to telling the story and further enjoying – being around food trucks. This week I highlight Not Just Icing. When I think of Donna Downs and Cristal Harrison, my first thought is the Odd Couple. For those not familiar with the TV comedy, it had two opposites living together in an apartment which ensued laughs with their clashing personalities. While many would think, two opposites operating together would clash and the business with it – these contrasting personalities really cook. Cristal fits into the front of the house well. She outgoing, which makes her a great communicator and relates with guests on a personal level, and applied her past accounting software consulting experience into the business. Donna fits into the back of the house well. While she may not be as outgoing as Cristal, she is adroit as a surgeon on icing a cupcake and handles baking with ease. While different in personalities and roles, they believe in the same food truck strategy. I’ve always been a fan of Not Just Icing and I remember the first day I met them at social media event in North Hills. I had just started blogging and I hadn’t found my niche. A few days after that event, I was walking down Fayetteville Street for one of the Downtown Raleigh Food Truck Rodeos. It was then I heard my blog’s name aloud. Confused, because “no one knows me,” I said to myself. 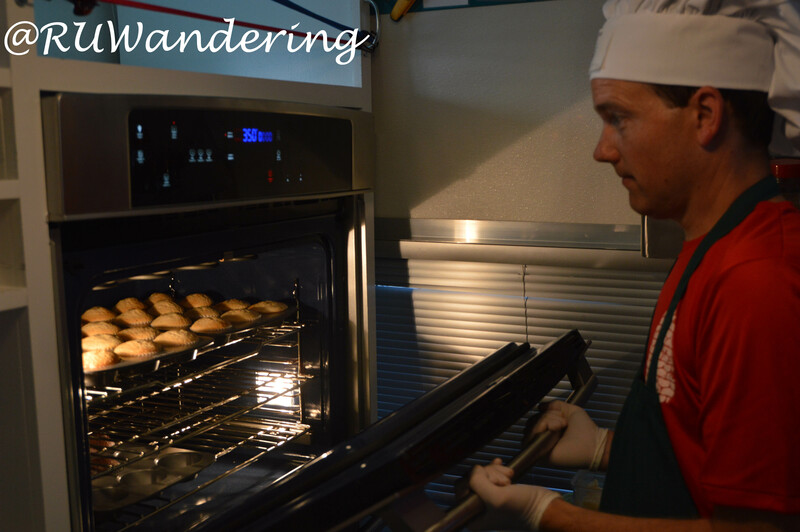 I turn and hear a chorus of voices came from Joy, Not Just Icing’s retro RV, “Wandering Sheppard! Wandering Sheppard!” I was flattered they remembered who I was, even though it was brief. 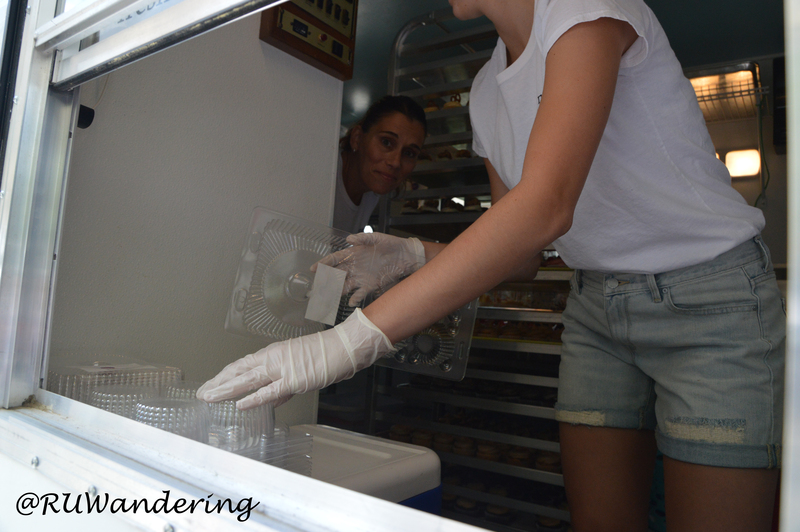 Last month, this blog’s readers voted Not Just Icing as their Favorite Food Truck. As I read over my notes, I can’t deny the readers are onto something. The one thing that I am always drawn to is how they give much back to the community whenever they can. I witnessed multiple times from their participation in the first Durham Rescue Mission rodeo, helping spread the word for Operation Stuff The Truck at the last Downtown Raleigh rodeo, and raising the stakes when Triangle Explorer and I collected tips for the local Food Bank in our blogger takeover. They set a great example of the food truck citizen. 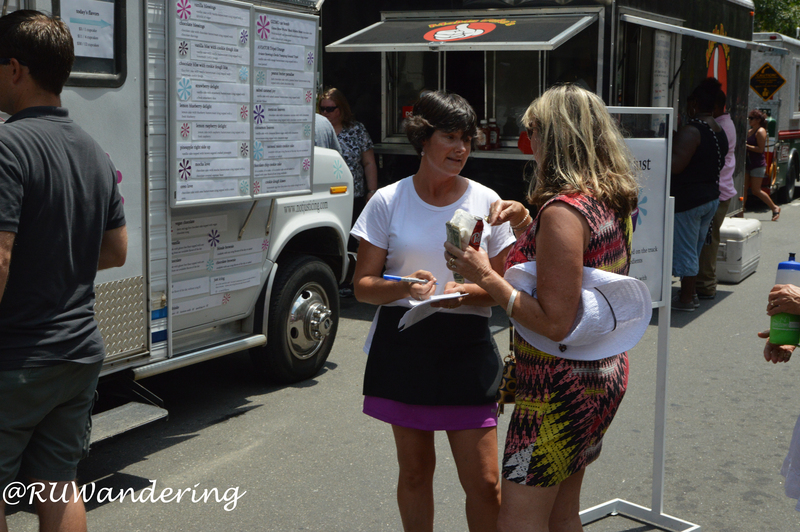 Why did you get in the food truck business? Both Cristal and Donna are mothers of young children all active in various activities. Before the truck, Cristal worked long hours away from home implementing software solutions. Any business traveler knows this is draining you physically and emotionally with the family life. Though she had that entrepreneurial spirit to work for her own. Donna worked in a sales support role that she enjoyed. However, there was something missing there and she wanted something she could really be passionate about. After a birthday party (ironically for the truck’s first employee, Hannah) and getting rave reviews for Donna’s cookie dough recipe, this put the key in the ignition for Not Just Icing. From here it seemed Not Just Icing hit green lights from idea conception to first event. 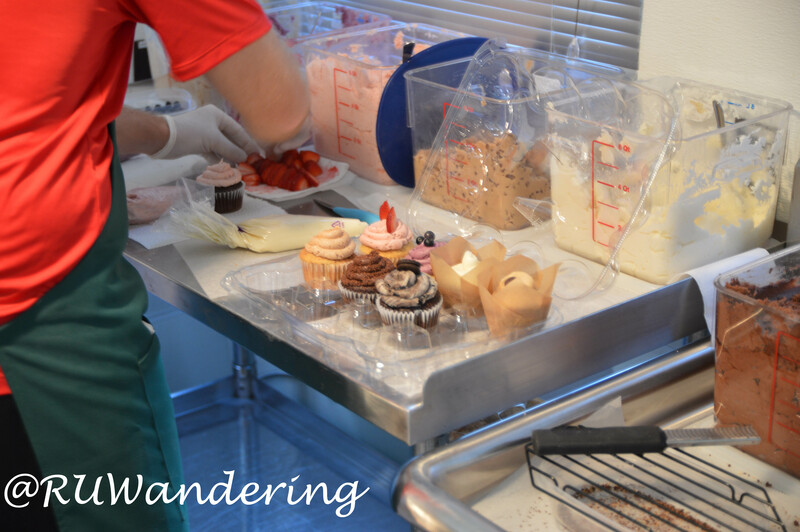 Their truck, a retro RV is nostalgic reminder when cupcakes where made of real ingredients was only 7 miles away. Before you know it, the truck was parked at their first event was an Outdoor Concert at the American Tobacco Campus in Durham on May 17th. And while many think all those green lights within a year span, Not Just Icing was up and running in less than a month (from all the business documentation to that first event). Any plans of expanding outside of Joy? Before Joy baked her first cupcake, many persuaded Donna to open a retail bakery. These supporters insisted she needed that retail presence to be successful. After many conversations, my impression is Not Just Icing is committed to the food truck model. What is your favorite cupcake? Cristal enjoys the Lemon Raspberry Delight, as the fruit option, and the Salted Caramel Blonde Brownie. Donna enjoys the Mexican Heaven cupcake, which has a bit of heat thanks to Cayenne powder on the icing and the Coconut icing. Each cupcake is iced on the truck. Do you have an icing you would like to add? They are constantly updating the menu. Recently, they added Rocky Road, Cannoli Cream, Pink Grapefruit, Caramel Apple, and Pina Colada. They also incorporate local beer into their cupcakes for events. At Gizmo Brewworks 1st Anniversary party, they used their Beekeeper Honey Wheat and Black Stiletto Stout to make two yummy cupcakes. As I left Big Boss Brewery, they had a Harvest Time growler after inspiration sparked after one sip. One thing I enjoy is they can ice to order. I brought a co-worker one time and she couldn’t decide between Peanut Butter and Banana. Donna put both Peanut Butter and Banana icings and Cristal called it an Elvis. What community organizations have you helped? One thing I constantly hear is, “this month we are going to help,” and a charitable organization is said. 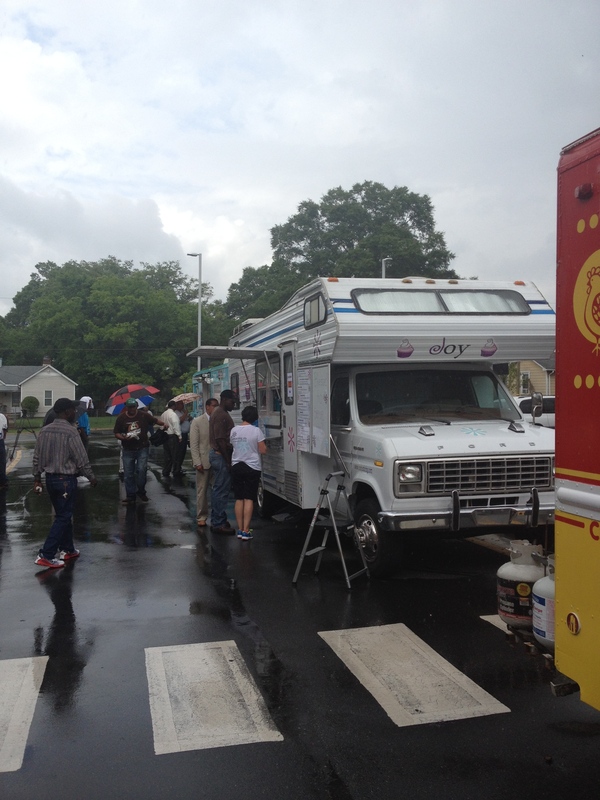 This reiterates what I said before, they are a great food truck citizen. Several organizations they have gave back to: Wake County Animal Shelter, Safe Haven, YMCA: We Build People, the Homeless at Moore Square, NC Association Against Sexual Assault, Food Bank of Eastern North Carolina, Durham Rescue Mission, Activate Good, NRCA Golf Tournament, SCNC of North Carolina, and North Carolina Chapter of the Leukemia and Lymphoma Society. In September, they are benefitting Childhood Cancer Awareness Month. The commitment to real ingredients is not just a business decision. Its all the way to the home. Fresh off a trip to Portland and visit to Voodoo Doughnuts, I tossed some inspirational ideas to Donna’s daughter. I asked, “How about a vanilla cupcake with vanilla icing topped with Fruity Peebles?” I never expected the look or response I got back. As a kid, my teeth would rot just from the sugary thoughts in my head. But she turned to me and said, “that’s gross and its all processed foods.” I couldn’t believe a kid would know all that. The other note I leave with is their offerings of Gluten-Free (the ingredients are gluten-free) and Vegan cupcakes. The reasoning, “Everyone should have a cupcake,” Donna responds. 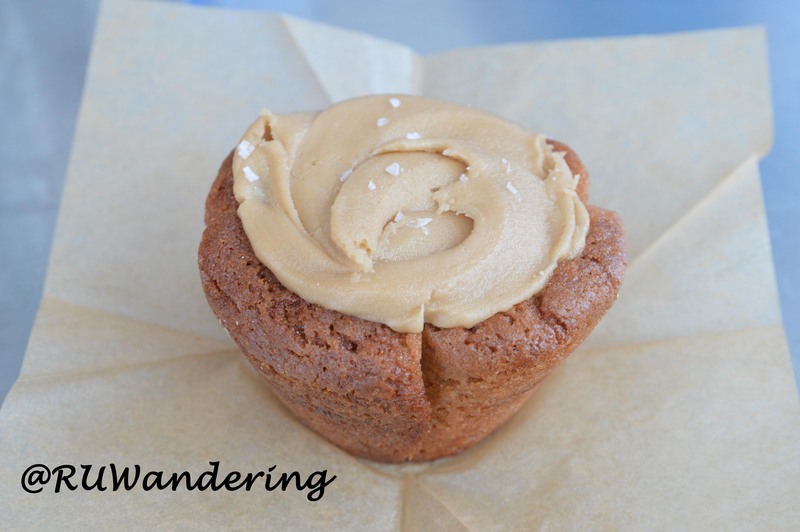 With all the versatility of icing options and cupcakes, most dietary needs can be accommodated by the food truck.